Find a vacation home to rent in Castelsardo from our list of vacation rental properties. Campaya has over 59 vacation homes available in Castelsardo, which give you the possibility to locate a unique accommodation in Castelsardo which completes your check-list in search for the perfect self catering vacation apartments in Castelsardo or vacation villas in Castelsardo. This lovely holiday apartment is situated on the 1. Beautiful, comfortable residence "L'Ancora". 2 km from the centre of Castelsardo, in a quiet, sunny position, 500 m from the beach. For shared use: swimming pool (6 x 3 m, depth 100 - 200 cm, 15.05. 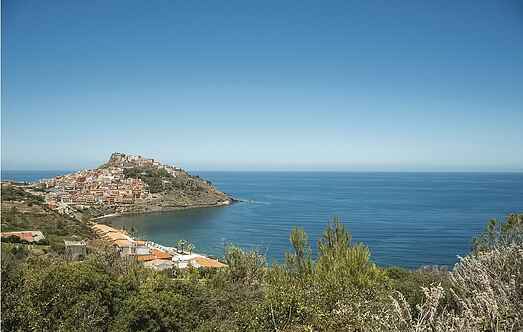 Newly built apartment with views of the famous Castle of Castelsardo and the Gulf of La Vignaccia. Apartment in a small apartment building of 12 residential units, in the picturesque medieval village of Castelsardo. This lovely two bedroom, two bathroom detached house enjoys simply stunning views of the sea and the Gulf of Asinara. It is the ideal location for a peaceful and relaxing holiday. Apartment with views over the castle of Castelsardo and the Gulf "La Vignaccia." Only a few minutes walk from the center of Castelsardo. Holiday apartment on the ground floor in a residential complex with pool to be shared 500 m from the seaside in Lu Bagnu. This large villa is divided into 3 apartments and located right on the beach on the coast of Castelsardo. Why not spend your next self-catering trip in this very well-equipped and functional holiday apartment. Apartment in a semi-detached house, located in the characteristic seaside resort Lu Bagno of Castelsardo. A large panoramic terrace is at guests’ disposal. Apartment in a semi-detached house set on the hill in front of Castelsardo. View up to Corsica. The house is set near a mountain and the rear rooms overlook a bright interspace. Apartment in a two-family villa along the coast of Castelsardo located directly on the sandy beach.